Every now and again I like to return to old projects and try and improve upon them. A chance to redesign our garden also had me thinking about how to incorporate previous studio ideas of mine into it. This is the result. The last two of these points are the most important because they influence where everything else can be sited, so it was crucial to start with these. Researching government regulations and manufacturers recommendations meant that there is only one specific spot that the new oil tank can go, and only one spot that the new septic tank can go. So these were put in their place first and the rest of the garden designed around them. The problem was that this left the oil tank right in the middle of the middle level of the garden. Happily though, this middle section of the garden is somewhat superfluous. It currently houses my decrepit shed which will be demolished anyway, as well as a small section of grass which is a nuisance to cut. My solution was to completely get rid of the middle section of grass and curve the sloped path around the perimeter of it, encasing the oil tank in the middle. With a bit of screening, and maybe some wall climbing plants (not shown) this should hide it from most angles. The extra space is turned into a bike store and the occasional bit of planting. This solves a lot of problems in one swoop, with the bonus of providing much needed storage. Access was improved not only by the new sloped path, but also a set of steps. The current ones are steep and uneven in length and height making it quite difficult to navigate. The new steps are all the same height, length and depth, with an added landing leading to the existing decking. 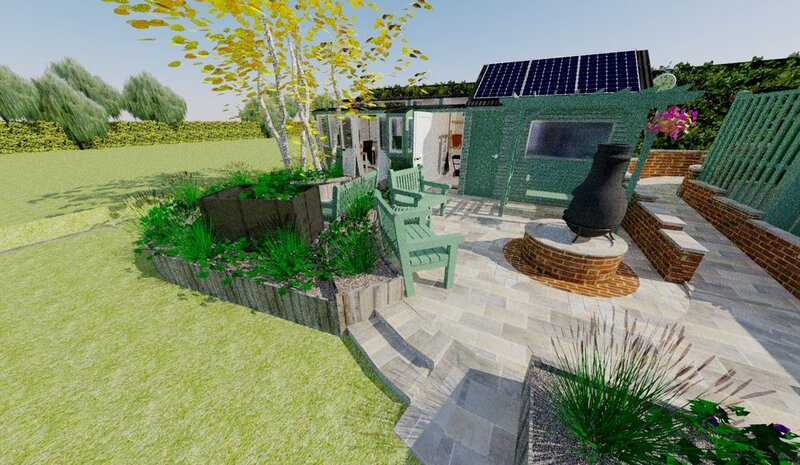 Other areas of improved access include to the existing shed (shown with solar panels which aren't currently fitted in real life, but would make a good addition). As the shed is raised on a 30cm tall foundation, I've raised the section in front of it by the same amount and paved it all. There is currently a small overgrown pond here, and whilst it is quite a nice feature, it needs replacing. There is a combined step/slope down to the grass level for easy access with a lawnmower etc. 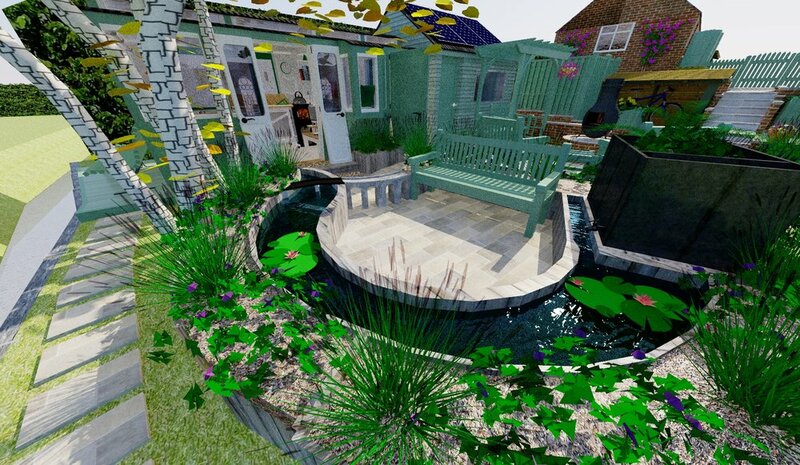 The water garden on the left of the above view is probably my favourite addition, although I may well change it slightly to incorporate different levels of water. I'm still working on this. The theory being that this is a place to relax - surrounded by water, plants, and a view of the meadows. Whilst I haven't shown it, the railway could easily fit around the edge of this raised flowerbed. Widening it a little bit would give me more room to help blend it better. With some selective planting, small rockery areas, and little cameos it's an interesting proposition. Combined with some nice handbuilt structures and it will really make the garden come alive. Anyway, I digress - that was just a little flight of fancy. Back to the real design, and we'll move to the area in front of the existing shed. I felt we needed an outdoor place for entertainment, especially during the summer months. We currently have a rectagular brick barbeque on the decking, which is obviously not ideal. To fit with the circular theme of my design, and the brick retaining walls, I've gone for a circular brick firepit, with slabs on top. This also gives us a better place for our chimenea which also sits on the decking currently. With these two features plus plenty of seating, you could quite easily hold a BBQ for a fair amount of people, whilst still being in amongst them rather than on a seperate part of the garden as is the case now. And just for the sake of completeness, here you can see new retaining wall holding up the bank. This is simply made from I beams and railway sleepers. 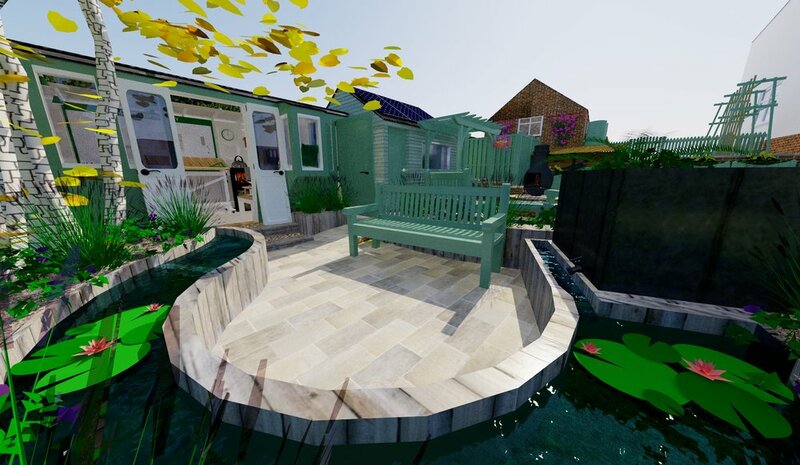 You can also see the trees I've had to design around, and stepping stones that lead to the tiny bit of decking with a suitably painted bench. Next post: We take a more indepth look at the changes to the old carriage design as seen above.